The thinner 564XL black ink is figure 1 on Ciara_B 's post. You just need to make sure the part number is CN684W or CN680W. I know eBay has them. The retail package that are sold in the store usually does not have part number. Another question I see in this thread, some users confuse black with "photo black" which are not the same. This is from figure 2. It is this specific cartridge I need. I have the wider one to the right (I have 4 of them, because I keep trying to buy the thinner one on the left and get the wrong size every time). The cartridge you need is the Photo cartridge, NOT the black cartridge. It will have a camera on the package, or is included in the color pack that has four cartridges. You should be able to find the photo cartridge in stores or online, such as here from HP. I am not an employee of HP, I am a volunteer posting here on my own time. Similar but different problem. I have a 3 year old HP 3522-e . 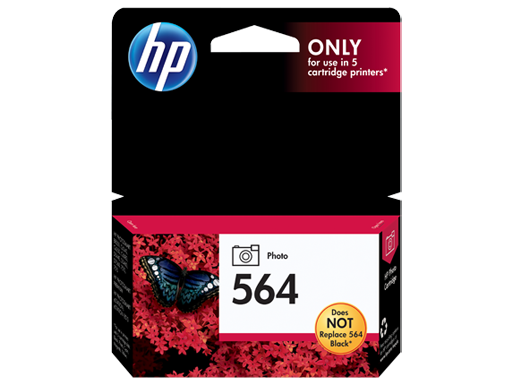 The cartridge tray has room only for 4 narrow 564 cartridges. The marking above the cartridges gives their colors and implies the black one is wider. But the tray itself seems to have a block (can't remove it) at the right side limiting the black cartridge to the same size as the color ones, about 1/2" in width. I can post a picture later if anyone cares. I have a 7520. THe new wider black 564 XL cart will not fit. The older one is 2016/05 the new one that wouldn't fit is 2016/10. There are two sizes of Black XL Cartridges. The black one that comes in the pack with the other colors is the same size as those colors and will not fit, as the opening in the printer is compatible with the double size XL cartridge. Why are both sizeds labeled XL? I plan to return this set of 4 identical size 564s, and get a "double-wide" XL Black 564, which will fit. It should be labeled XXL! Thank you for your response. After fooling with it for 15 or 20 minutes I put it aside for a while and came back to it later. It fit on my first try. Go figure. I have an HP Photosmart 5520 printer I purchased a 4 pack of XL ink and the black is smaller than the old black XL and I cannot get it to fit in the printer. THANK YOU for the picture... finally figured out my problem - I was trying to replace the Black 564 on the far left, while most folks seeme to be talking about the 564(old XL) on the right. The one I need to replace should be the one with the "photo" version. Duh? I guess so, but I simply interrupted it as a 564. The newer 564 will NOT fit on the left side. Yoir picture helped me to understand that.